The number of hundred gives me some feeling of happiness. Four years ago, I planned an exhibition of 100 work pieces of glass painting in order to commemorate the 40th anniversary since our gallery was established. Glass painting is rather old art, but Haruo Sato loved this art very much as small antiques. While some of them may look like toys but there are some work pieces which express something large in scale. In the meantime, Ms. Emiko Horimoto says she is ready to challenge the glass paintings. Ms. Horimoto is an energetic contemporary artist who just held the 100th exhibition together with Noh-mask work pieces produced by his father, a 100-year-old sculptor. Small but highly concentrated work pieces of glass painting will fit to a small island country of Japan. The exhibitions named “Message of the Universal Love” have lasted for more than 25 years. Last July such exhibition was held for one full month at the museum in Khabarovsk, Russia. It was a great success. Glass painting is the first experience for me. I have been enchanted with the atmosphere of brilliant jewels created by glass paintings using gold and silver leaves. 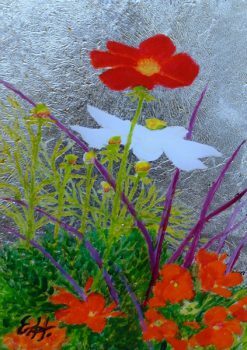 I hope I could express “peace” and “energy for life” even in the small world of glass paintings. It would be nice if you would feel them in each of my 30 work pieces. Please enjoy them. To the world of myth G21-1. Material: Mixed technique and silver leaf on the glass plate Cosmos and geranium G14-1. Material: Mixed technique and silver leaf on the glass plate. The latest visit of the Japanese, Emiko Horimoto, to the Far Eastern capital came to be new feelings to her – she saw the city from the bird’s flight height, rang the bell of the main Orthodox Cathedral in the Krai* and found that she wished to reflect her impressions into new paintings. For the whole month, her personal exhibition had been working in the Khabarovsk Krai Museum after N.I. Grodekov, it was named “Message of the Universal Love” – “Послание вселенской любви». This name was not chosen by chance – during a serious operation, Ms. Horimoto-san has borne a near death experience and has seen somebody, very big and kind, over there, out of the verge. This is what she tells about by her paintings. “Current. To the Universe,” “Current. Wind of the Universe,” “Current. Light of Hope” – only names of the paintings tell a lot about to such an unsophisticated spectator like me. By the way the paintings are typically Japanese. 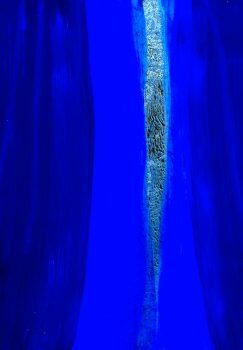 A great part of the art works is painted with blue and its shades, blue is the author’s favorite color. This is my first exhibition in the Russian museum, so it’s a very interesting experience for me. 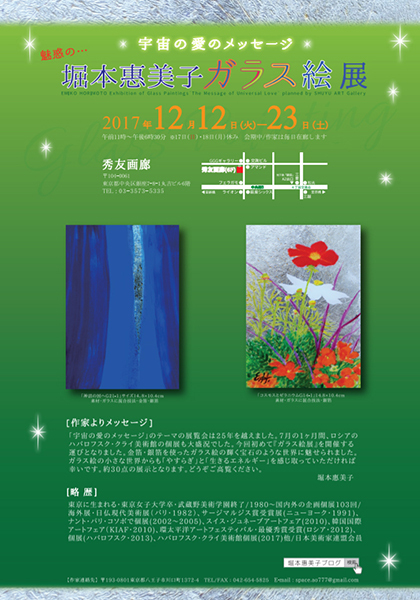 Earlier I introduced my art works at the University Hall (Teachers’ Institute of the TOGU, four years ago), – Emiko Horimoto says. – Khabarovsk has changed a lot since that time. It has become much brighter, cleaner and more beautiful. I have been very busy, this time my exhibition is being held in Japan, so I have got tired a little. But this Cathedral (the Savior Transfiguration Cathedral on Glory Square) is a real discovery for me. It is lighter and of other color than the one on Konsomolskaya Square. Visit to the Khabarovsk Orthodox Seminary became one of different points of the cultural program which had been prepared for Emiko Horimoto, a graduate of the Tokyo Woman’s Christian University, and her assistant. At the Seminary library, the guests were shown old books, they were explained some procedures and meaning of drawings on the walls in the Church after St. Innokentiy Moskovskiy. But the tourists mostly enjoyed their rise to the Cathedral Bell Tower and possibility to play the bells. I saw Orthodox Cathedrals in Kosovo, and think that the Russian religion is like the Serbians’ one, – noticed Emiko Horimoto. – But I believe, there is something which is greater and stronger than Christianity, Buddhism or other religions. This is a great, rational origin, it is located over everything, existed far longer than the gods of all times and civilizations, it is still near us. Sunrises and sunsets, seas and mountains, especially the Fuji, are the main topics in the Japanese artists’ creativity, so Horimoto-san’s painting is. Her art works in watercolor and acryl, with delicate change from one color to another, effectively show current of the world around us and complicated space fluctuations. Sometimes, to start new art works you need some impulse, like the view from the Savior Transfiguration Cathedral Bell Tower became an impulse for our guest. The Khekhtsir can’t be compared with the Fuji, but this mountainous contour also attracted her attention. 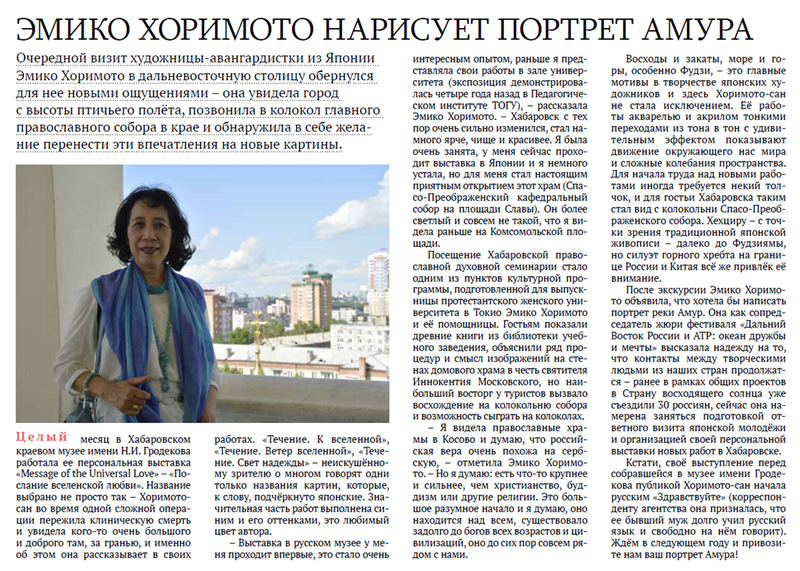 Being International Judges’ Chief of the Ocean of Friendship and Dream Festival, Emiko Horimoto-san has expressed her hope that contacts between creative people from our countries will be continued – 30 Russians have already visited the Land of the Rising Sun, and now she is going to prepare the next exchanging visit of the Japanese youngsters, as well as her new personal exhibition in Khabarovsk. By the way, Horimoto-san has begun her speech in front of Grodekov Museum visitors with the Russian “Zdravstvuite” (as she has explained to the reporter, her ex-husband has been learning Russian language for a long time and now he can speak it fluently). We are waiting for you next year – and bring your the “Amur River’s Portrait” to us!